I made dinner. This was the chicken I made. 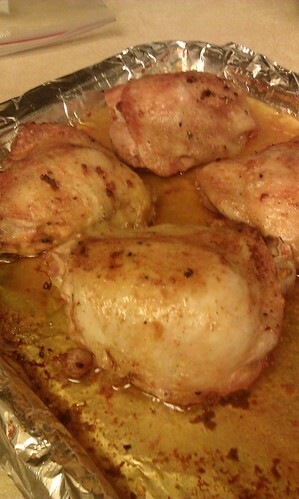 Ok, instead of using a whole chicken, I used four bone-in skin-on chicken thighs. However, I didn’t reduce the ingredients for the rub/paste. I assumed it would be ultra flavorful because of that. But that was not the case. This was pretty bland. In fact, Mark reached for the salt right away. I was pretty disappointed too. Now, the meat was juicy – so that was a good thing. But, it really lacked the flavor punch that I was hoping for. So, I consider that a fail. I won’t be making it again. And, for my eighth challenge, I made this as my side dish. I did not use the slivered almonds. And this was only ok as well. We both thought it was an odd combo with the sweetness of the brown sugar and the balsamic vinegar. 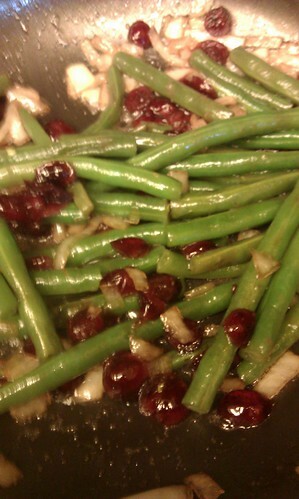 The cranberries were only ok. After they are steamed they tasted different with the balsamic vinegar. I love dried cranberries, but not this way. They turned soggy and lost their flavor. So, this too was a fail. In fact, the only thing that was good at dinner was my salad. Just plain salad. The chicken and beans will not be made again. Bummer! It’s always disappointing when meals don’t turn out great, especially when we plan and put a lot of effort into them. Hope your next attempts are better!